Nathan Cearley and Erica Bradbury have been composing analog synth works as Long Distance Poison since 2010. 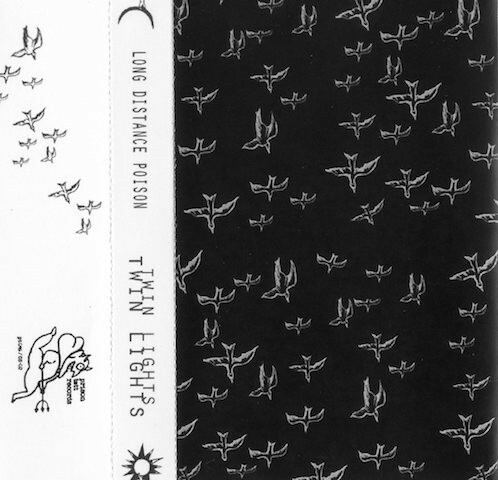 Most of the releases from this Brooklyn duo are on cassette (though the only one we have so far is a 12″ single) including this 2015 tape from Prison Tatt. Each side of Twin Lights Twin Lights holds a sidelong track. “Mosa” (T1) immediately swells into a vicious surge of sound. At the center of the piece are heavy, earth-shaking pulses, but as it unfolds, subtler details begin to emerge. There’s tones twisting outwards, insectoid flourishes, bizarre melodies that hiss, crawl, breathe. The piece includes hydrophone recordings of the East River. “Infra Viam (Live At Death By Audio, 9/19/12)” (T2, Cearley and Bradbury are joined by Casey Block on a Micromoog), a live track from the now shuttered NYC studio/venue, feels like the afterimage of the first side: we hear settling dust clouds, smoldering remains, piano-like notes blurred beyond recognition, glowing embers, droning echoes, absence. Recommended if you enjoyed getting lost in the void of Zaimph’s latest work.